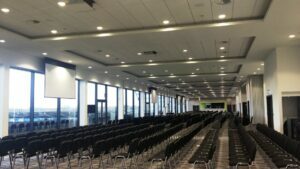 The AJ Bell Stadium offers an attractive collection of spaces available for occasions of all shapes and sizes. 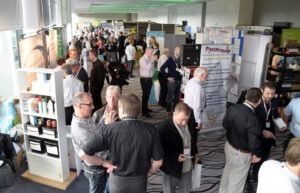 Whether you need a meeting room for 20 delegates, a large venue to deliver conferences or are planning a spectacular product launch, the AJ Bell Stadium is one of the best conference venues in the North West. 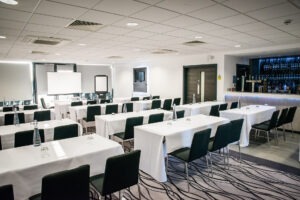 Whatever the reason for your conference, and whatever format you decide to take, we here at The AJ Bell Stadium are confident we can provide you and your delegates with the space and the service that you are looking for. 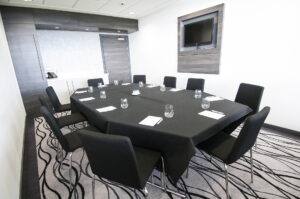 Whether you are looking for a private 2 to 1 interview space, a private boardroom meeting for 20 guests, or if you are simply looking for a venue that inspires creativity, then make sure you speak to our team here at The AJ Bell Stadium. What better venue is there to host an event designed around staff training and team building, than the home training ground of the Salford Red Devils and Sale Sharks themselves? First impressions matter, it’s as simple as that, and we understand that more than most here at The AJ Bell Stadium, and with the launch of a new product this could not be more important.